Ashley Byrd has been promoted to Chief of News Services for Learfield News, Inc., a national news and sports broadcasting company headquartered in Jefferson City, Missouri. She and her family have moved to nearby Columbia, Missouri, and are learning every day how the Midwest is connected to South Carolina. Ashley now oversees all of the Learfield newsrooms, which are in Missouri, Nebraska, Iowa, Wisconsin — along with South Carolina. One can still hear her voice occasionally on SC Radio Network affiliates. 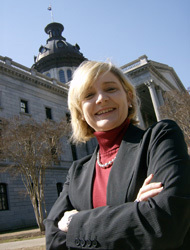 Ashley began as news director for SC Radio Network five years ago. She is grateful that many years ago, she got her first radio experience on WJES-WKSX in Johnston, also a Learfield affiliate station. She also got early journalism experience working for various newspapers in Edgefield. She encourages any SEC fans to get in touch if they come to see their teams play Mizzou. Ashley is the oldest daughter of Buzz and Ann Byrd of Edgefield.